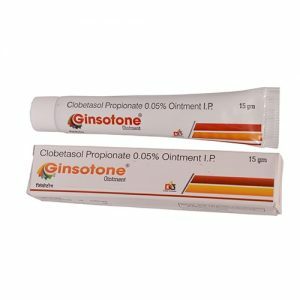 Ginsotone Cream | Clobetasol Propionate 0.05% w/w – The medication is used for treating a number of skin problems such as rash, allergies, dermatitis, eczema, psoriasis etc. Clobetasol is helpful in treating itching, redness, swelling that take place in any kind of skin problems. The drug is highly effective on these problems. Thoroughly wash your hand before applying this medication. Wash the affected area and dry it. Apply a thin layer of this medication over the affected area and gently rub it. You have to use this medication 2 times on daily basis. Avoid the interaction of nose, mouth, and eyes while applying these drugs. Precaution– Use this medicine only after getting the proper guidance of a doctor.